1/ Formerly, leader of the Collaborative Study of Cassava in Africa 1989–97, International Institute of Tropical Agriculture, Nigeria. In Africa (sub-Saharan Africa), the diffusion of cassava can be described as a self-spreading innovation. Cassava was introduced into Africa by Portuguese traders from Brazil in the 16th century (Okigbo, 1980). It was initially adopted as a famine-reserve crop. In the Democratic Republic of Congo (hereafter referred to as “the Congo”) where the crop was first introduced, millet, banana and yam were the traditional staples but farmers adopted cassava because it provided a more reliable source of food during drought, locust attack and during the hungry season 1. Although there was some local trade in cassava, production was mostly for home consumption and cassava was prepared in the simplest fashion, i.e. slicing and boiling (Jones, 1959). Currently, about half of the world production of cassava is in Africa. Cassava is cultivated in around 40 African countries, stretching through a wide belt from Madagascar in the Southeast to Senegal and to Cape Verde in the Northwest. Around 70 percent of Africa's cassava output is harvested in Nigeria, the Congo and Tanzania (IFAD and FAO, 2000). Throughout the forest and transition zones of Africa, cassava is either a primary staple or a secondary food staple. Africa is a continent in crisis; it is racked with hunger, poverty and the HIV/AIDS pandemic. Africa is also the region with the fastest population growth, the most fragile natural resource base and the weakest set of agricultural research and extension institutions. The average GNP per capita in Africa in 2000 was US$480 (World Bank, 1999). Civil strife and authoritarian regimes have destabilized many countries. Around three-quarters of the poor in Africa are rural people who secure their livelihood from agriculture. Africa's population is expected to double to 1.2 billion in 2020; and its urban population will grow at a faster rate (McCall, 1999). Without question, domestic food production and/or food imports will have to be increased to meet Africa's growing food demand. Due to poverty and a lack of foreign exchange, Africa's net cereal imports are expected to remain low (Pinstrup-Anderson et al., 2000). Therefore, the urgent challenge before African nations is to increase domestic food production. Maize is Africa's most important food crop and it is held up as a model food crop to meet Africa's growing urban demand for convenient food products (Mellor et al., 1987, Blackie, 1990 and Byerlee and Eicher, 1997). Maize production however, is risky because of unpredictable rainfall. Cassava is Africa's second most important food staple in terms of per capita calories consumed. Cassava is a major source of calories for roughly two out of every five Africans. In some countries, cassava is consumed daily and sometimes more than once a day. In the Congo, cassava contributes more than 1 000 calories per person per day to the average diet and many families eat cassava for breakfast, lunch and dinner. Cassava has the potential to increase farm incomes, reduce rural and urban poverty and help close the food gap. Without question, cassava holds great promise for feeding Africa's growing population. Cassava can be produced with family labour, land and a hoe and machete, making it an attractive and low-risk crop for poor farmers. Also, cassava is available to low-income rural households in the form of simple food products (for example, dried roots and leaves) which are significantly cheaper than grains such as rice, maize and wheat. Similarly, urban households in many parts of West Africa consume cassava in the form of gari2 (Nweke et al., 2001). Cassava has several other advantages over rice, maize and other grains as a food staple in areas where there is a degraded resource base, uncertain rainfall and weak market infrastructure. It is drought tolerant; this attribute makes it the most suitable food crop during periods of drought and famine. Cassava has historically played an important famine-prevention role in Eastern and Southern Africa where maize is the preferred food staple and drought is a recurrent problem. However, cassava has been neglected for numerous reasons by researchers, African policy-makers and by most donor and international agencies. Cassava is a marginalized crop in food policy debates and burdened with the stigma of being an inferior food, ill suited and uncompetitive with the glamour crops such as imported rice and wheat because of several long-standing myths and half-truths. Many food policy analysts consider cassava as an inferior food because it is assumed that its per capita consumption will decline with increasing per capita incomes (Nweke et al., 2001). Until the late 1980s, information was very scarce on cassava in Africa. However, in 1989, a Collaborative Study of Cassava in Africa (COSCA) was initiated by the Rockefeller Foundation and based at IITA. During an eight-year period (1989 to 1997), COSCA researchers collected information from 1 686 households in 281 villages in six countries: the Congo, Côte d'lvoire, Ghana, Nigeria, Tanzania and Uganda. The goal of the Global Cassava Development Strategy (GCDS) is to analyse cassava production and utilization trends; identify constraints and opportunities in the cassava sector with emphasis on poverty alleviation, equity, food security and environmental protection; and develop a set of priorities for future intervention in the cassava sector (Spencer and Associates, 1997). This review is based on information from the six COSCA study countries supplemented with secondary data from FAO and various information collected from African farmers, researchers, traders and processors throughout Africa from the beginning of the COSCA study in 1989 to 2001. This review shows how the planting of new Tropical Manioc Selection (TMS) cassava varieties developed and released to farmers in Nigeria in the 1970s by IITA, has transformed cassava from a low-yielding famine-reserve crop to a high-yielding cash crop. The review also shows that with the aid of mechanical graters to prepare gari, cassava is increasingly being produced and processed as a cash crop for urban consumption in Ghana and Nigeria. The next stage in the cassava transformation is from a food crop to a raw material for livestock feed and industries in order to raise farm income. Traditionally, cassava is produced on small-scale family farms. The roots are processed and prepared as a subsistence crop for home consumption and for sale in village markets and shipment to urban centres. Over the past 30 to 50 years, smallholders in Ghana and Nigeria have increased the production of cassava as a cash crop, primarily for urban markets. This shift from production for home consumption to commercial production for urban consumers, livestock feed and industrial uses can be described as the cassava transformation (Table 1). During the cassava transformation, high-yielding cassava varieties increase yields while labour-saving harvesting methods and improved processing technology reduce the cost of producing and processing cassava food products to the point where they are competitive with food grains such as wheat, sorghum and rice for urban consumers3 . Looking ahead, as the costs of cassava production, harvesting, processing and marketing are reduced, one can expect cassava to play an expanded role as a source of industrial raw material in Africa and as a source of foreign exchange earnings through the export of cassava pellets for livestock feed. In the early 1960s, Africa accounted for 40 percent of world cassava production and Brazil was the world's leading cassava producer. However, thirty years later in the early 1990s, Africa produced half of the total world cassava output and Nigeria replaced Brazil as the leading producing country globally (FAOSTAT). Two forces explain this dramatic growth. First, demand for cassava has expanded because of rapid population growth and increased poverty thus, encouraging consumers to search for cheaper sources of calories. Second, the supply of cassava has expanded because genetic research and better agronomic practices have boosted cassava yields, especially in Ghana and Nigeria. In the early 1960s in Africa, cassava was planted in 5.6 million ha per year. Thirty-five years later, in the late 1990s, it was planted in 10 million ha per year. The six countries which currently account for most of the cassava area are the Congo, Côte d'lvoire, Ghana, Nigeria, Tanzania and Uganda. The cassava planted areas increased almost three fold in Ghana and Nigeria from 1961 to 1999 (Table 2). One of the critical variables in the expansion of the cassava area is the availability of improved processing equipment to remove water from the roots (the roots are 70 percent water) and thereby reduce the cost of transportation. Improved processing and food preparation methods reduce bulk and make it possible for cassava products to be transported at reduced costs over poor roads to distant urban market centres. One example is the steady shipment of dried roots (cossettes) from Bandundu region of the Congo to the capital city, Kinshasa, by boat along the Congo River or by trucks over extremely poor road conditions. The COSCA study found that in Ghana and Nigeria, all the villages where farmers had access to mechanized cassava graters, reported an increase in the area planted to cassava. By contrast, only 60 percent of the villages where farmers did not have access to a mechanized cassava grater in the two countries, reported an increase in the area planted to cassava. To summarize, between 1961 and 1999, the cassava planted areas have increased several fold in two of the six most important cassava producing countries in Africa, namely Ghana and Nigeria. The increase in the cassava area in Ghana and Nigeria was driven by availability of processing technologies and improved road access to market centres. In 1954, the average cassava yield in Africa was between 5 and 10 tonnes per ha (Jones, 1959). The COSCA study found that the average yield was between 10 and 15 tonnes per ha in the six COSCA countries in the early 1990s. Therefore, one can safely say that the cassava yield was increasing in Africa in the early 1990s because of the planting of high-yielding varieties and the adoption of better agronomic practices4. In early 1991, the COSCA yield measurements showed that the average on-farm cassava fresh roots yield (hereafter yield) for the six COSCA study countries was 11.9 tonnes per ha5. The average farm-level yield was highest in Nigeria where the mean was 14.7 tonnes per ha followed by Ghana where the mean was 13.1 tonnes per ha (Figure 1). The mean yield was around 10 tonnes per ha in Côte d'Ivoire, the Congo, Tanzania and Uganda, respectively. In 1973, Lagemann studied cassava yields in three villages in southeastern Nigeria with different population densities and concluded that cassava yield declined as population pressure increased (Lagemann, 1977). Lagemann found the mean yields for the three villages to be 2 tonnes per ha in the high population density village; 3.8 tonnes per ha in the medium; and 10.8 tonnes per ha in the low population density village. In 1993, the COSCA study team re-visited the same three villages to assess the trends in the cassava yield 20 years after the Lagemann 1973 study. The COSCA team found that the mean yields for the same villages were 4.04 tonnes per ha in the high population density village; 4.77 tonnes per ha in the medium density; and 9.27 tonnes per ha in the low population density villages. 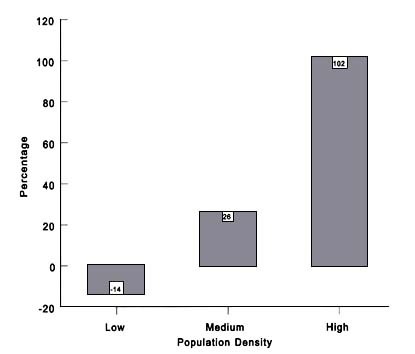 Between 1973 and 1993, the cassava yield doubled in the high-density village, increased by 25 percent in the medium-density village and declined by 15 percent in the low-density village (Figure 2). This is a surprising result that deserves to be carefully examined. The doubling of cassava yield in the high population density village is because farmers planted the high-yielding TMS varieties at high stand densities, employed hired labour and enjoyed ready access to a nearby market6. By contrast, yields declined in the low population density village because farmers planted local varieties at low stand densities (Enete et al., 1995). The evidence from the COSCA study demonstrates that farmers have adopted new technologies such as the improved varieties and the improved agronomic practices as a response to increased population pressure on land. This finding adds evidence to the Boserup hypothesis that increased population pressure can help induce intensification of agricultural production (Boserup, 1981). Between 1961 and 1999, total cassava production in Africa nearly tripled from 33 million tonnes per year in the early 1960s to 87 million tonnes per year in the late 1990s (FAOSTAT). Food shortages precipitated by a combination of political and civil unrest, economic stagnation, erratic rainfall patterns and rapid population growth have had a much greater influence on cassava production in Africa than anywhere else in the world (Scott et al., 2000). Most of the dramatic increase in cassava production in Africa was achieved in Ghana and Nigeria. In both countries, the production growth rate was higher than the rate of population growth. In the other COSCA study countries, an increase in cassava production kept pace with population growth. The dramatic increase in cassava production in both Ghana and Nigeria was achieved through an increase in both area and yields. The availability of cassava graters to farmers in both countries released labour, especially female labour, from cassava processing for planting more cassava. Common use of hired labour in both countries and wide adoption of the high-yielding TMS cassava varieties were responsible for higher cassava yields than in the other COSCA countries. Farmers in Africa grow several cassava varieties. For example, the COSCA researchers identified over 1 000 local cassava varieties in six counties of the study, namely the Congo, Côte d'lvoire, Ghana, Nigeria, Tanzania and Uganda. The farmers group the local cassava varieties into the bitter and the sweet varieties7. The sweet varieties are more popular in Côte d'lvoire, Ghana and Uganda while the bitter varieties are more common in the Congo, Nigeria and Tanzania. The COSCA farmers reported that the bitter varieties are more resistant to pests, higher yielding and store better in the ground than the sweet varieties. Farmers, however, plant sweet varieties in the forest zone more than in the transition and the savannah zones because limited sunshine in the forest zone makes it difficult to sun-dry the roots after they have been soaked to eliminate cyanogens. Tree crop farmers also plant sweet varieties which they eat without the soaking and sun-drying (and not fearing cyanide poisoning). As the productivity of the cassava system increases and more cassava is processed as gari, the issue of the sweet or the bitter cassava varieties will become irrelevant. Cassava has been under attack by pests and diseases, such as the mealybug, green mite, mosaic disease and the bacterial blight. The biological control method has been used to bring the mealybug under control while the biological control of the green mite is still in progress (Herren et al., 1987 and Yaninek, 1994). The most promising method of controlling the mosaic disease and the bacterial blight is breeding resistant varieties, which involves a long and painstaking process of breeding and diffusion. Meanwhile, the green mite, mosaic disease and the bacterial blight continue to cause yield losses in various parts of Africa. In the late 1980s, an epidemic of an extremely severe form of the mosaic disease spread through most of Uganda. Researchers discovered that a new form of cassava gemini virus caused the virus epidemic. The Uganda variant of the gemini virus is now widely distributed in Uganda (Harrison et al., 1997). African farmers usually do not attempt to control the cassava pests and diseases with pesticides because of the limited access to chemicals and because it is not profitable to apply pesticides on cassava. However, farmers use the following agronomic practices to achieve partial control of the cassava pests and diseases: fallow rotation, crop rotation and selection of the pests and diseases-resistant local varieties. Most of the major cassava pests and diseases are new in Africa as they were introduced only within the last 30 years. Improved quarantine inspection is needed to prevent, as much as possible, further introduction of new problems. There is a need for better preparedness to control new problems before they spread and take root in Africa. The colonial governments' research on cassava was inspired by the appearance and rapid spread of the mosaic disease in East Africa and by the colonial governments' determination to encourage the planting of cassava as a famine-reserve crop in their colonies. The colonial governments set up cassava research programmes in various countries in West, Central and East Africa, but the most successful was the one set up at the Amani Research Station in Tanzania in the 1930s. The mosaic disease-resistant hybrids developed at the Amani research station between 1935 and 1957 served as the foundation for IITA's research programme on cassava in the 1970s and 1980s. Soon after most African countries became independent in the 1960s, cassava research languished in most national research programmes. In 1971, IITA established a research programme on cassava. IITA's programme built on local materials and on materials collected from various parts of the world (particularly from the Amani Research Station), helped national agricultural research systems to establish cassava programmes and establish partnerships with farmers, the private sector and numerous national cassava programmes. For example, IITA realized that national cassava research programmes were under funded and in a state of disarray. Most national agricultural research systems in Africa did not have cassava research programmes in the early 1970s. IITA needed to help develop strong national cassava research programmes in cassava producing countries in Africa in order for IITA's cassava varieties and agronomic practices to be evaluated over a wide range of African agro-ecologies. IITA took steps to persuade governments of several of the large cassava producing countries to establish cassava research programmes in the agricultural research system9. To facilitate cooperation among scientists in national programmes, the International Society for Tropical Root Crops - African Branch (ISTRC-AB) was founded in 1978 by IITA. Regional root crop research networks were set up in Eastern and Southern Africa in 1987/88 with support from IITA. The national research capacity which IITA helped to build, made it possible for IITA's varieties and field practices to be evaluated over a wide range of environments in Africa. IITA developed high-yielding mosaic-resistant varieties in six years (1971 to 1977) of research. These new high-yielding mosaic-resistant varieties included TMS 50395, 63397, 30555, 4(2)1425 and 30572 (hereafter cited as TMS varieties). The new TMS varieties out-yielded local varieties on farmers' fields by 40 percent without fertilizer. COSCA studies in Nigeria found that the TMS varieties are superior to local varieties in terms of yield, earliness and pest and disease tolerance and they are as good as the local varieties in terms of various post-harvest attributes and for intercropping. The evolution of cassava breeding in Africa can be described as a human ladder. Starting in the 1930s, one generation of breeders climbed on the shoulders of the past generations until they hit the jackpot with the TMS varieties in the mid 1970s (Table 3). The cassava genetic improvement in Africa however, represents work in progress. For example, although the TMS varieties bulk earlier than the local varieties, they are not suitable for intensive commercial production because they take 13 to 15 months to attain maximum bulking. If farmers plant cassava under continuous cultivation, it will be harvested at less than 12 months and before it has attained its maximum yield. Cassava producers in Nigeria who plant the TMS varieties and make gari available for sale in urban markets, complain that the peeling of the roots of the TMS varieties is labour intensive. The roots of the TMS varieties are not suitable for the development of mechanized peeling because they lack uniform shape and size. The TMS varieties are widely diffused in Nigeria and to a lesser extent in Ghana and Uganda. Diffusion in Nigeria. The rapid diffusion of the TMS varieties in Nigeria starting in 1977 was facilitated by the 40 percent increase in farm-level yield, the profitability of the new varieties, the collaboration of National Root Crops Research Institute (NRCRI), the oil sector, the World Bank, IFAD, churches, the Nigerian Cassava Growers Association; and by government oil revenue and the availability of low cost gasoline. The diffusion in Nigeria was also facilitated by the physical presence of IITA in Nigeria. IITA's cassava diffusion programme multiplied and distributed TMS planting materials directly to farmers and indirectly through informal channels such as schools and churches. IITA's diffusion programme mobilized the private sector, particularly the oil sector, for assistance in the distribution of the TMS varieties. IITA's cassava programme also mobilized the mass media including the newspapers, radio and television to publicize the availability and benefits of the TMS varieties. The boom in the petroleum industry in the 1970s and the resultant economic expansion in Nigeria led to an increase in the purchasing power of urban consumers and an increase in demand for convenient food products such as gari. With the aid of the petroleum revenue, Nigeria was able to improve rural roads; expand agricultural research, extension and higher education institutions and finance nationwide demonstrations of the TMS varieties. Yet it is important to point out that improved cassava food preparation technologies, namely gari preparation and the mechanized grater, were in place at the farm-level in Nigeria before the TMS varieties were introduced to farmers in the late 1970s. The availability of mechanized processing equipment and gari preparation technologies greatly increased the profitability of the TMS varieties. Finally, farmers were able to utilize mechanized graters because diesel and gasoline were cheap and readily available. Mechanized graters have saved labour and shifted the labour constraint from grating to the labour-intensive tasks of harvesting, peeling and toasting. The labour requirements for those tasks increase in direct proportions with yield. The end result is that farmers who adopted the TMS varieties are often restricted in the amount of cassava they can produce by the labour bottlenecks at the harvesting, peeling and toasting stages. Mechanization of any of the harvesting, peeling and toasting tasks will enable farmers to plant a larger area to the TMS varieties. There is an urgent need for breeders to develop varieties which attain a maximum yield in less than 12 months and have uniform roots in shape and size in order to facilitate the development of mechanical harvesters and peelers. Diffusion in Ghana and Uganda. In 1988, IITA helped the Government of Ghana to secure financial assistance from international donor agencies to launch a nationwide programme of on-farm testing of the TMS varieties. It took five years, 1988 to 1993, to evaluate the TMS varieties under field conditions and multiply the stem cuttings. In 1993, sixteen years after the release of the TMS varieties in Nigeria in 1997, the Government of Ghana officially released three TMS varieties, namely TMS 30572, TMS 50395 and TMS 4(2)1425. In 1998 the Root and Tuber Improvement Programme was initiated by the Ministry of Food and Agriculture in Kumasi to multiply and distribute plant cuttings of TMS varieties. In December 2000, the total area planted with the TMS varieties for multiplication was 1 142 ha (Otoo and Afuakwa, 2001). The diffusion of the TMS varieties in Ghana from 1993 to 2001 has not been documented. However, in early 2001, cassava researchers at the Crops Research Institute, Kumasi reported that TMS varieties covered large areas of farmers' fields in the Eastern, Greater Accra and Volta regions where farmers prepare gari for sale in urban centres (Otoo and Afuakwa, 2001). Ghana's official release of the TMS varieties in 1993, 16 years after they were released in Nigeria, represents a delayed diffusion, which is attributed to a variety of reasons. First, the Government historically invested in maize research, the primary food staple and only initiated cassava research in the national agricultural research systems (NARs) in 1980. Second, some influential Ghanaian scientists did not encourage the Government to import the TMS varieties because the influential Ghanaian scientists were proud of their breeding work. In Uganda, government and donor interest in the diffusion of the TMS varieties was sparked by the appearance and rapid spread of the rare form of cassava mosaic disease in the late 1980s. Beginning in 1991, TMS 6014, TMS 30337 and TMS 30572 were multiplied. In 2000, approximately 80 000 ha of the mosaic-resistant TMS varieties were being grown in Uganda (Otim-Nape et al., 2000). Fallow systems. There are three main fallow systems in Africa: the long fallow, short fallow and continuous cultivation. Due to population growth, cassava cultivation under the long fallow system has declined in Africa. The distribution of cassava fields surveyed by COSCA researchers was as follows: long fallow, 5 percent; short fallow, 75 percent; and continuous cultivation, 20 percent. Most farmers now produce cassava under the short fallow system because of cassava's long growth period, pests and disease problems and compatibility with crops such as yam and maize, which are grown in association with cassava. Cassava production under continuous cultivation is an increasing practice in many African countries in response to the increasing population pressure on land. Increasing production of cassava under continuous cultivation points to the need for early-bulking and pests and diseases-resistant cassava varieties. Cassava planting. In Africa, the main source of cassava planting materials is from the farmers' fields, neighbours and sometimes cassava marketing middleperson. Some farmers who produce cassava as a cash crop, plant healthy-looking cuttings from plants not older than 12 months. Some farmers do not always discard stems affected by pests or diseases even though this is a common way of spreading the pests and diseases (Rossel et al., 1994). In the forest zone where biomass production is higher than the savannah zone, there is an abundance of cassava stem cuttings for planting. However, in the savannah zone, cuttings for planting are often in short supply. The COSCA study found that farmers in the savannah zone discontinue the use of varieties, which produce low yields of the planting material. Farmers need help with the supply of healthy cassava planting materials particularly in the savannah zone. The cassava plant density is an important agronomic consideration because it is positively and strongly correlated with the cassava yield. The most commonly recommended spacing for cassava is 1 m x 1 m which is equivalent to a plant density of 10 000 stands per ha (Onwueme, 1978). The average farm-level plant density for the six COSCA study countries was 8 000 plants per ha. The cassava stand density in the farmers' fields varies widely from 500 plants per ha to 40 000 plants per ha depending on climatic zone, the cassava morphological characteristics such as branching type and leaf shape, soil fertility status, seed-bed type and cropping pattern, etc. Farmers who plant cassava as a cash crop plant at higher plant densities than farmers who plant the crop as a famine-reserve crop or as a rural food staple. The factors surrounding cassava plant density are so numerous that the optimal plant density for high cassava yield is location specific. Local agronomic research is needed to determine the optimum cassava plant density. Research on cassava is not carried out at the required local level in any of the six COSCA study countries because the NARs do not have the resources necessary for detailed cassava field experiments. In Africa, cassava is frequently grown as an intercrop with other crops (Fresco, 1986). In the six COSCA study countries, 60 percent of the cassava fields are intercropped and 40 percent mono-cropped. Cassava/maize intercrop is the most common, constituting about 50 percent of all cassava-based intercropped fields. Other combinations are cassava/bean (or pea), cassava/banana (or plantain), cassava/rice, cassava/millet (or sorghum), cassava/yam and cassava/sweet potato. Cassava's flexible planting schedule, its wide interspacing and its slow rate of growth relative to maize, for example, make it suitable for intercropping. Cassava does not have a critical planting date as long as there is enough moisture at planting for rooting to commence. The actual date of planting is determined by the arrival of the rainy season. In West Africa, cassava is planted from the beginning of the rainy season (February–March) to the end of the rainy season (October-November). The cassava planting date is also significantly influenced by the intercropping needs of farmers. Farmers delay the planting of cassava in intercropped fields, depending on the growth cycle of the associated crop. If the associated crop is a short-cycle crop such as maize, cassava is often planted one month later than the maize. If the associated crop such as yam has a long growing period, cassava is often planted as much as three months later than the yam. The delayed planting strategy reduces competition for insulation and soil fertility between cassava and the intercrops thus allowing the mono-crop stand density to be maintained for cassava. The strategy is possible because cassava is drought resistant provided there is enough moisture at planting for rooting to commence. To summarize, farmers need assistance with a supply of healthy cassava planting materials. Local agronomic research is needed to determine optimum plant stand densities. Cassava's flexible planting date enables farmers to plant high-yielding large-canopy cassava varieties in intercropping. The cassava intercrops are grown on small family plots. For example, the COSCA study found that the average cassava field area per household was less than one hectare in all the COSCA study countries. The predominance of intercropping and small farm size in cassava production has implications for development of cassava production technologies in Africa. Production and harvesting. Cassava is reputed to be a crop that requires relatively low labour inputs for production. However, COSCA research confirms that this conventional wisdom is valid only where cassava is produced as a famine-reserve crop or as a rural food staple. When cassava is produced as a cash crop, farmers use significantly more labour. In most of the COSCA study villages, all the field tasks for cassava production are done manually, using simple implements such as a hand hoe and a cutlass. In Nigeria where the TMS varieties and improved agronomic practices have boosted yields by 40 percent, the labour constraint has shifted from cassava weeding to cassava harvesting. Harvesting is now proving to be a serious constraint on the spread of TMS varieties because labour for cassava harvesting increases in direct proportion to yield. The general food supply outlook, market conditions and labour availability for harvesting and processing influence the cassava-harvesting schedule. During drought and a period of attractive market prices farmers harvest their cassava early, sometimes before roots attain their maximum bulking. For the six COSCA study countries, the average age of cassava fields at harvest was 11.9 months with a range of six to 49 months. Cassava is planted as a cash crop in Ghana and Nigeria. 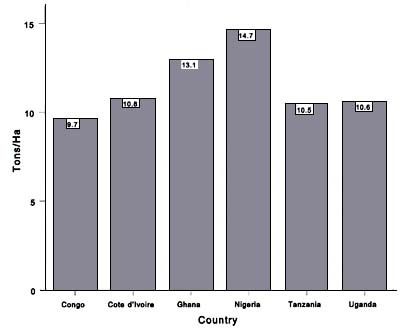 The amount of cassava harvesting labour per hectare was higher in Ghana and Nigeria than in the other COSCA study countries. In fact, Table 4 shows that harvesting cassava is the most labour-intensive field task in Ghana and particularly in Nigeria where the TMS varieties and improved agronomic practices have boosted yields by 40 percent. In Ghana and Nigeria, the labour constraint has shifted from cassava weeding to cassava harvesting. Harvesting is now proving to be a serious constraint on the spread of TMS varieties. It is not surprising that those farmers who plant TMS varieties in Nigeria have sometimes had to suspend planting because they were unable to hire sufficient labour to harvest previously planted cassava fields. To date, most public sector research on cassava has focused on genetic research. Very little research has focused on developing machines to harvest cassava. Without question, a mechanical revolution is now needed to break the labour bottleneck in cassava harvesting among farmers in Ghana and Nigeria who are planting the TMS varieties. The analyses in this section show that farmers will introduce new agronomic practices (length of fallow period, quality of planting material, plant density, planting date, cropping pattern, quality of weeding and age of the cassava roots at harvest) as cassava production becomes profitable. However, progressive farmers who adopt improved agronomic practices are facing production and harvesting labour bottlenecks which are limiting the amount of cassava they can grow. Without question, agronomic and genetic-induced productivity changes are important sources of growth in the cassava industry. Mechanical technology for cassava production and harvesting is needed to complement improved agronomic practices and high-yielding varieties. The mechanization of harvesting is needed to break labour bottlenecks, increase labour productivity and encourage the farmers to increase the use of TMS varieties. In Africa, there are five common groups of cassava products: fresh root, dried roots, pasty products, granulated products and cassava leaves10. Fresh root. The roots of sweet cassava varieties are eaten raw, roasted in an open fire, or boiled in water or oil. The cyanogens in the roots are destroyed by slowly cooking the roots. Starting with cold water, gradual heating promotes the hydrolysis of the cyanogen (Grace, 1977). Dried roots. Dried cassava roots are stored or marketed as chips, balls and flour. Chips and balls are milled into flour at home by pounding with a pestle and mortar in preparation for a meal. There are two broad types of dried cassava roots: fermented and unfermented. Preparing unfermented dried cassava roots by sun- or smoke-drying is the simplest method of cassava preparation. Since this method is inefficient in the elimination of cyanogens, it is used mostly for preparing sweet cassava varieties, which have low cyanogen content. In the case of fermented dried cassava roots, the fermentation is accomplished in one of two ways: stacking in heaps or soaking in water for a number of days. The fermentation process, whether in water or in heaps, influences the taste of the final product. The longer the fermentation period, the stronger is the sour taste. Taste is an important attribute, especially for consumers who eat fermented cassava products and who desire the strong sour taste. The recent introduction of a grater has eliminated stacking and fermentation and therefore saves time. The roots are simply peeled, washed and grated11. The pulp is placed in a perforated container, covered and a weight put on it for about three hours and the cyanogens are squeezed out along with effluent. The half-dried pulp is then dried in the sun (Alyanak, 1997). In Africa, cassava is sun-dried on virtually any surface in the open air such as a large flat rock in the field, on the shoulders of a paved road, on flat roof tops, in a flat basket, or even on bare ground. Bright colour is an important attribute desired by consumers12 . The colour of dried roots depends on the method and duration of the fermentation, on the method of drying, the efficiency of the drying energy and the cleanliness of the drying environment. Pasty products. Two forms of pasty cassava products are common in Africa: uncooked and steamed pastes. The most popular is called uncooked paste because it is stored or marketed without cooking. To prepare the uncooked paste, the roots are soaked in water for three to five days, during which time the roots soften and ferment. The soaked roots are manually crushed and sieved by shaking it in a basket in a sack under water, thereby separating the pulp into the sack while collecting the fibre in the basket. Cooked cassava pasty products have been recently introduced in Nigerian urban markets. Every evening in major cities in the cassava growing areas of Nigeria, it is common to find women selling cooked cassava paste wrapped in plastic bags. As women go home from work or from the market, they stop and buy some for the evening meal. Although more research is needed on preparation methods, cooked cassava paste is a promising food for busy urban consumers. Steamed paste (for example chickwangue in the Congo) is a product that can be stored or marketed in a steamed form. To prepare the paste, fibre is removed by hand from roots fermented by soaking in water. The roots are then stacked in a heap to further ferment. The pulp is ground with a stone or pounded in a mortar. The resulting fine pulp is firmly wrapped in leaves and steamed. The double fermentation as well as the steaming imparts a long shelf-life to steamed paste. The sour flavour achieved through extended fermentation is a characteristic that is cherished by regular customers. It is also a turn-off to potential new consumers. Steamed paste is stored or marketed in a ready-to-eat form. Preparing steamed paste is expensive because many steps are involved and each one requires additional inputs. For example, grinding and sieving are labour-intensive. The soaking step is water-use intensive and steaming is fuel wood-use intensive. In the Congo, steamed paste -chickwangue- is prepared entirely by women. Granulated products. In Africa, there are three common types of granulated cassava products: gari, attieke and tapioca. The methods for making granulated cassava products originated in Brazil. To prepare gari, fresh cassava roots are peeled, washed and grated. The resulting pulp is put in a porous sack and weighted down with a heavy object for three to four days to express effluent from the pulp while it is fermenting. The de-watered and fermented lump of pulp is pulverized and sieved and the resulting semi-dry fine pulp is toasted in a pan. The grating, effluent expressing, pulverization, toasting and the addition of palm oil are adequate to reduce cyanogens to a safe level (Hahn, 1989). Fermentation imparts a sour taste to gari. The duration of fermentation varies depending on consumer preference for sour taste. The COSCA study found that commercial gari processors in Nigeria ferment cassava for different lengths of time depending on the market. Toasting extends the shelf-life so that gari can be easily transported to urban markets. If kept in a dry environment, gari will store better than grain because gari is not known to be attacked by weevils (Okigbo, 1984). The second type of granulated cassava products is attieke, a type of steamed cassava that is found only in the Côte d'lvoire. Attieke is made in much the same way as gari with more or less the same inputs. However, instead of toasting, attieke is steamed. Attieke is available in a wet form and it has a shorter shelf-life than gari. The third type of granulated cassava product is tapioca, which is primarily consumed in Benin, and Togo13. To prepare tapioca, cassava is grated and then put in water, pressed and kneaded to release the starch. The starch is permitted to settle at the bottom of the container and the water is drained off. The operation is repeated several times to prepare a high quality product. The damp starch is spread on a pan and toasted in the same way as gari, to form a coarse granular product. Cassava leaves. Cassava leaves are edible and a more convenient food product than fresh roots. Cassava leaves are storable in dry form and since they have lower water content, they are less expensive to dry than the roots. If leaf harvesting is properly scheduled, it does not have an adverse effect on cassava root yield (Dahniya, 1983 and Lutaladio and Ezumah, undated). Cassava leaves have a nutritive value similar to other dark green leaves and are an extremely valuable source of vitamins A (carotene) and C, iron, calcium and protein (Latham, 1979). The consumption of cassava leaves helps many Africans compensate for the lack of protein and some vitamins and minerals in the roots. Cassava leaves are prepared by leaching them in hot water, pounding them into pulp with a pestle and mortar before boiling in water along with groundnuts, fish and oil. This process eliminates cyanogens from the leaves, making them safe for human consumption. Cassava leaves are an important vegetable in the Congo and Tanzania. The COSCA study found that farmers in the Congo select cassava varieties with a large canopy of leaves. In Tanzania, farmers plant tree cassava -mpiru - for the production of leaves. In countries where cassava leaves are eaten as vegetables, producers earn additional income by selling cassava leaves. Truck loads of cassava leaves, locally called pondu in the Congo, are a common sight on the roads from the provinces to urban markets in Kinshasa. Cassava leaves are not eaten in Uganda because their consumption is considered an indicator of low economic status (Otim-Nape, 1995). Cassava leaves are not eaten in West Africa, except in Sierra Leone, because several indigenous plants supply vegetables traditionally consumed with yam (Okigbo, 1980). Most of these vegetables are however, available only during the rainy season. Therefore, there is a seasonal gap in the availability of vegetables in West Africa which cassava leaves could fill. To summarize, the traditional methods used to make five cassava products are simple and are able to reduce cyanogens in cassava to safe levels. The methods have been influenced by the availability of sunlight, water, fuel wood and wage rates. This diversity of natural resources and differentiated wage rates have contributed to an array of cassava products in Africa. There is regional variation in cassava preparation methods in Africa and a major challenge is to diffuse the best practices from one region to other regions within Africa. There are three common types of mechanized cassava processing machines in use in Africa: graters, pressers and mills. Mechanized grater. The traditional method of grating cassava was by pounding it in a mortar with a pestle. Later, artisans developed a manual grater in the form of a sheet of perforated metal mounted onto a flat piece of wood. The mechanized graters were first introduced to Republic of Benin, by the French in the 1930s and later modified in Nigeria in the 1940s by welders and mechanics, using local materials such as old automobile motors and scrap metal. Village entrepreneurs, who provide a grating service to farmers, own the mechanized graters. The mechanized grater operators allow the farmers flexibility in terms of working time and quantity of cassava grated. The fee charged is a small fraction of the cost of grating by hand. In Ghana and Nigeria, commercial gari processors use the mechanized grater. The use of a mechanized grater has reduced gari processing costs by 50 percent and dramatically increased the profitability of gari production with the TMS varieties in Ghana and Nigeria. Since the grating task is mechanized, peeling is now the most labour-intensive task followed by the toasting in gari preparation. In Côte d'Ivoire, many attieke processors do not use the mechanized grater because the texture of attieke made with the mechanized grater is not as good as that of hand-made attieke. The planting of the TMS varieties is not profitable to farmers who process cassava as attieke because hand grating is labour-intensive. Mechanized presser. Since cassava has high water content (70 percent), various methods have been developed to extract the water during processing. Traditionally, effluent is drained from grated cassava mash by putting it in a basket, covering it with leaves and placing a heavy object such as stone on top of it for three to five days. Fermentation takes place at the same time. Nowadays, most commercial gari makers in Nigeria and attieke makers in Côte d'lvoire use a screw jack to extract the effluent. The mechanized presser is a simple hand-operated machine, which is made from wooden plates and a used automobile jack, both of which are available in villages. In Nigeria, mechanized graters and pressers are often both operated and maintained by the same village entrepreneurs in major areas of commercial cassava production. This enables farmers to have access to grating, pressing, pulverizing and sieving services in a convenient location. Mechanized pressing reduces the processing time from several days to a few hours, but the inherent disadvantage of the mechanized presser is that it performs only the pressing step and it eliminates the fermentation step. Fermentation imparts a sour taste, which is cherished by consumers in some places such as in southwestern Nigeria. Fermentation is not essential for the elimination of cyanogens in the preparation of gari because grating, pressing, pulverization, sieving and toasting steps reduce the cyanogen in cassava to such a low level that gari is safe for human consumption. Mechanized mill. The traditional method of preparing cassava.flour from dried cassava roots is to pound the roots in mortar with a pestle. Today, mechanized mills are common place in the urban centres in the six COSCA study countries. The mills were also observed in several COSCA villages in Ghana, Nigeria and Uganda but in only a small percentage of the COSCA villages in the Congo, Côte d'lvoire and Tanzania. The components of the mechanized mill are also fabricated locally from scrap materials. a mechanized grater should be developed to make attieke with a texture as good as hand-made attieke. In the past, attempts have been made in the various COSCA countries by private entrepreneurs to process cassava on a large-scale using integrated grating, pressing, pulverizing, sieving and toasting machines in a factory style of operation. However, all of these firms failed because of an array of problems: lack of sustained public or private investment in research and development, shortage of cassava roots, fragmented market for cassava products, unacceptable consumer taste and high cost of labour for hand peeling. Numerous public sector agencies were established in Nigeria in the 1970s and 1980s to develop and diffuse mechanized cassava processing machines. However, farmers have not adopted the machines developed by the government agencies because the machines are not as convenient and reliable as those developed by the small-scale private artisans. Important lessons for mechanization of food processing in Africa emerge from this analysis of the evolution of mechanized cassava processing methods. Mechanization of food processing must be for products that have a market demand such as gari. Since most villages in Africa do not have electricity and petroleum fuel is scarce and expensive, mechanized machines should be small and easy to fabricate and repair by village artisans using local materials such as old engines and scrap metals. Machines that are manually driven are more suitable for remote villages provided they can be fabricated and maintained by village artisans using local materials. 1 The period before seasonal food crops are ready for harvest. 2 Gari is a granulated and toasted cereal-like cassava food product which is convenient for consumption in urban environments because it is in a ready-to-eat form and it has an extended shelf life. 3 This does not mean transformation in the processing sense from fresh root to processed forms. 4 In Africa, long-term research from the 1930s to the 1970s led to the development of high-yielding cassava varieties (the TMS varieties) that increased farm yields by 40 percent without the addition of fertilizer. The TMS varieties were released to farmers in Nigeria in the late 1970s. 5 Root yield as distinct from root yield; in some cassava producing countries in Africa such as the Congo and Tanzania, cassava leaves are harvested and eaten as a vegetable. 6 There is a positive relationship between stand density and yield. Farmers in high population density villages plant at high stand densities because of shortage of land. 7 The customary sweet and bitter cassava varieties depend upon the amount of cyanogens (prussic acid) in the edible parts of the roots (Jones 1959, p. 12). The roots of sweet cassava are low in cyanogens, mealy after cooking and usually eaten as a raw vegetable, boiled, or roasted in an open fire. Bitter cassava varieties are high in cyanogens, waxy after cooking and are harmful to humans and animals unless they are peeled, grated and toasted or soaked in water for a few days and boiled or sun-dried. 8 Cassava does not have a period of maturity. As the plant grows the root continues to bulk (swell) until after a stage of three or four years when deterioration begins. 9 For example, in the Congo, the Programme National du Manioc (PRONAM) was established in 1974; in Nigeria, the National Root Crops Research Institute (NRCRI) was established in 1975; in Côte d'lvoire, the cassava programme of the Institut des Savannes (IDESSA) was established in 1979; and in Uganda, the National Root Crop Research Programme was established in 1981. These programmes were established with IITA's technical assistance and with financial assistance secured with IITA's support from international donor agencies such as the USAID, IFAD, Gasby Foundation, etc. 10 It is difficult to separate cassava processing from cassava food preparation because some combinations of the cassava processing and food preparation activities lead to final cassava food products which are in ready-to-eat forms. Other combinations of the cassava processing and food preparation activities lead to intermediate products which are stored until the need arises for conversion into ready to eat forms. 11 This method was recently developed at IITA and it is now widely used by farmers in the major cassava producing countries. 12 Fifty percent of the farmer groups interviewed in the six COSCA study countries considered bright colour as the most important quality in the cassava food products, namely the dried cassava roots, the granulated cassava food products and the pasty cassava food products. Twenty-five percent considered texture, 15 percent considered taste and 10 percent of the village groups considered other qualities as the most important in the cassava food products. 13 It is also a common food used in making pudding for desert in the United States.